The Medieval sword weighs just slightly over 1 kg, or 2.2 pounds. 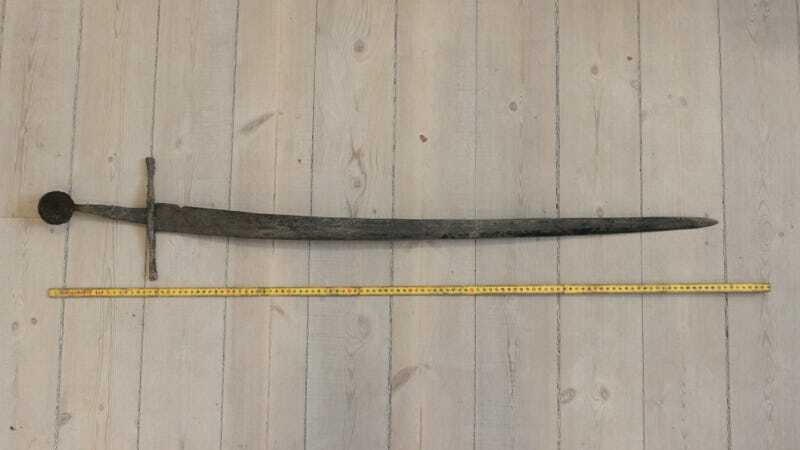 The blade, which the museum described as “still sharp,” measures 93 centimetres long (36.6 inches). From pommel to tip, the sword is 112 centimetres (44 inches) in length. Nielsen’s analysis found that it was a high-quality sword made with great skill. The narrow blade made the sword very light, and a recess running along the blade made it even lighter and thus easier to handle. Other elements, such as the quality of the disk-shaped pommel, the straightness of the cross-guard, and the blade’s rounded cross-section, point to a high level of craftsmanship. This was an expensive sword, according to the museum, and it likely belonged to someone with lots of money, perhaps a member of the nobility—who in those days were also warriors.